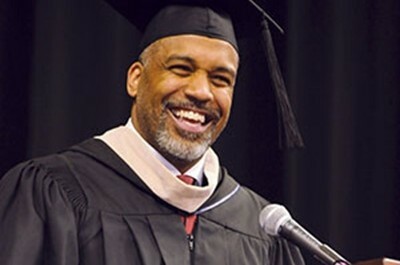 Adam Walker, president and CEO, Homestead Packaging Solutions, and a Gwinnett Tech Board member, was the keynote speaker for 2014 Commencement. 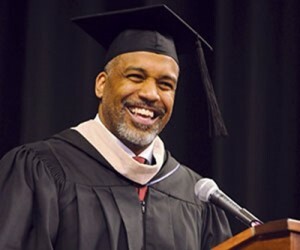 Gwinnett Tech faculty, staff and students celebrated commencement this week, with almost 600 graduates crossing the stage at the Gwinnett Arena. Gwinnett Tech has consistently been a state leader in graduation awards within the Technical College System of Georgia (TCSG) and to date, has awarded the highest number of awards within the system. The college has conferred almost 1,400 graduation awards to date, a number that will rise significantly in the coming weeks as summer term and the academic year concludes. Over the past decade, GTC has awarded the highest number of associate degrees and technical certificates in the TCSG. Gwinnett Tech board member Adam Walker, president and CEO of Homestead Packaging Solutions, was the keynote speaker, reminding graduates about the choices they would make after the ceremony. “Attitude is a choice,” said Walker. A former NFL player and a member of 1994 San Francisco 49ers Super Bowl XXIX championship team, Walker had a strong message for graduates about the value of hard work. Walker was not drafted into the NFL at the end of his college playing days at the University of Pittsburgh and was cut 24 times in two years in the NFL. He ultimately played for seven consecutive seasons in the NFL and received many awards for his superior leadership skills on and off the field. The 2013-1024 academic year marks another period of strong growth for Gwinnett Tech. GTC’s fall enrollment growth was the largest in the state system. Overall, the college enrolled just over 7,000 students for both fall and spring terms. Annually, GTC serves over 21,000 students in college credit, adult education and continuing education courses. Gwinnett Tech is now accepting applications for Fall Semester 2014. The priority application deadline is June 18. The deadline for financial aid is July 11. Fall classes begin August 19, 2014. — Gwinnett Technical College, one of Georgia’s largest technical colleges, is committed to delivering relevant knowledge to meet the workforce training needs of its community. The college offers more than 50 associate degree, diploma and certificate programs and hundreds of seminars, workshops and courses providing specialized training. GTC is Gwinnett County’s largest provider of corporate training and now serves residents and businesses in north Fulton County. Gwinnett Technical College is accredited by the Southern Association of Colleges and Schools Commission on Colleges to award the associate degree. Contact the Commission on Colleges at 1866 Southern Lane, Decatur, Georgia 30033-4097 or call 404-679-4500 for questions about the accreditation of Gwinnett Technical College. In addition, some college programs hold separate licensure or accreditation status with appropriate agencies. For more information, visit www.GwinnettTech.edu.